of Microtopping Admixture and Cement. Use a 5 gallon pail for mixing. Mix thoroughly with a mixing paddle and rotary mixer or drill, variable speed 400-800 rpm. A 1/2 inch nap lambswool roller is used to apply the bond coat, as well as the texture coat. 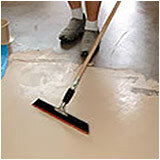 Microtopping can be spread with finishing trowel, or a flexible tool such as the “magic trowel”.